Tehran: Iran’s parliament on Sunday voted to impeach the country’s labour minister, the ninth minister from President Mahmoud Ahmadinejad’s cabinet to be sacked during the president’s second term in office. 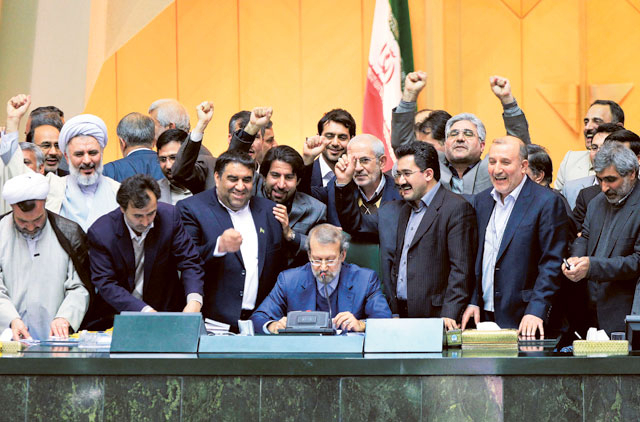 Sunday’s proceedings represent a dramatic escalation in the long-standing power struggle between Ahmadinejad and the speaker of Iran’s parliament, Ali Larijani. Mortazavi was removed from the judiciary for his alleged role in the deaths of prison inmates following Ahmadinejad’s disputed reelection. The impeachment of Shaikholeslami puts the Ahmadinejad government dangerously close to forcing a new vote of approval for the entire cabinet, which would almost certainly result in the removal of Ahmadinejad’s preferred ministers. Iran’s constitution states that if a majority of a president’s ministers are removed during a single term, the parliament must vote to re-approve the president’s cabinet choices. Ali Larijani and his brother, Sadegh, head two of Iran’s three branches of government, the parliament and the judiciary — positions they have used to attempt to foil Ahmadinejad. There is wide speculation that Ali Larijani will make a second bid for the presidency when Ahmadinejad completes his final term in June. Ahmadinejad addressed the lawmakers at the hearing on Sunday, which was broadcast on state radio, saying, “As the president, I’ve come here today to defend the constitution.” He went on to accuse speaker Larijani of overstepping his power as Iran’s top lawmaker. “Tell people that the president you have selected is under the power of the speaker of the parliament,” he said. Ahmadinejad went on to describe a video in his possession which he said showed Ali Larijani’s younger brother Fazel attempting to make illegal financial deals with Mortazavi, the former head of the social security fund.